The inhabitants of this world has forgotten the time of devastation brought about by the two world wars (World War I and II) and now they are prepared for the third world war. The world leaders have forgotten the fact that another world war (World War III) will eventually end the world. But there is one person who knew this terrible outcome. He has been prepared by the guardians (protectors) for this kind of situation. They are the protectors of ancient knowledge who are waiting for an epoch change for the past five thousand years. Will this man be able to protect the world? Will he succeed to protect life on earth? Suyash: An Engineer turned author; after working for 13 years in MNCs & Maharatna PSUs Suyash chose writing to serve society. The knowledge he gained from the preparation of Civil services; his experience with professional life and society; he wrote it in the form of story. Suyash belongs to a freedom fighter family and understands his responsibilities towards the society and nation. 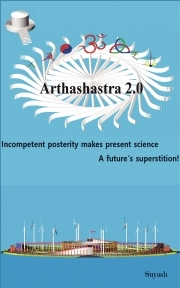 Arthashastra 2.0 is his first novel which includes Dharma; Education system; Economics system; Corruption; social issues. Arthashastra 2.0 is the forecast of World War III based on the present world scenario. Arthashastra 2.0 talks about the imbalance life style of the people and suggests how to balance it. 'Why Do I Hate Democracy?' was his second book and became best sellers #1 at Amazon Political Ideology Category. 'Goddess Of The Conspiracies' is a series on Politics and Religion Creeds.